Both of these orders were founded by Saint John Eudes, close friend of Saint Vincent de Paul, in the early 17th century. The Eudist Servants Of The Eleventh Hour is an association of the faithful whose members are sisters who are mature women who love Jesus and want to follow Him by serving the poor and the needy. The Eleventh Hour refers to the scripture where Jesus calls the last, and signifies that the community is for older women, generally between the ages of forty five and sixty five. The reference to St. John Eudes is recognition that the community is part of the Eudist Congregation, and it is also in honor of St. John Eudes spirituality. 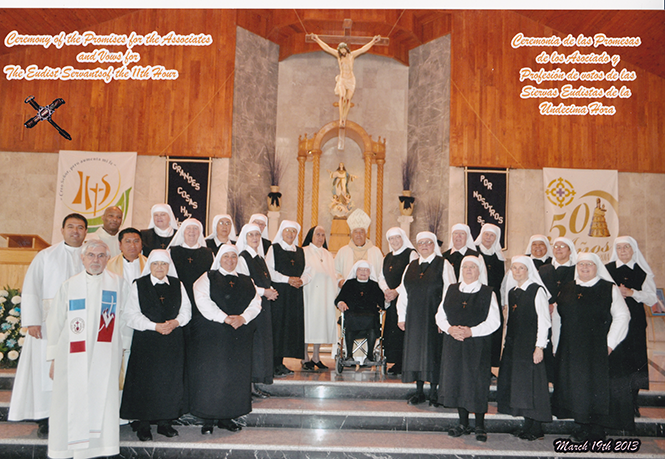 In 2003 the Eudist Servants Of The Eleventh Hour community was formally accepted by Bishop Rafael Romo Munoz of Tijuana, Mexico. The community’s mission is to minister to the poor and the needy, to bring to them the love of Jesus Christ. To accomplish this members must, in their hearts and in their lives, bear the pain of the poor, the imprisoned, the sick, the rejected, the forgotten and the abandoned children of God. Members of the community serve, with the permission of the local Bishop, in a variety of locations in Mexico and the United States, and perform a variety of services. The Servants operate a ministry center, Casa Campos de San Miguel, located just three blocks from the La Mesa penitentiary. The Casa is a refuge for women leaving prison and for women visiting incarcerated family in the nearby prison, and also for women and children who have come to Tijuana for treatment for cancer. The sisters also have a convent nearby, Corazon de Maria, which serves as the community headquarters and is also a residence for some of the sisters in Tijuana. Corazon de Maria is also used as the community’s house of formation. Still other sisters and associates live in the United States and commute daily to Tijuana to visit area hospitals and comfort patients and their families. All of the sisters are self-supporting, both economically and with their own health care. Vows are taken for a one year period and then renewed annually, if mutually agreeable.